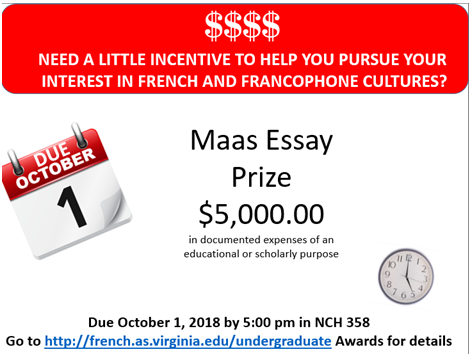 The Department of French at the University of Virginia announces the annual essay competition for The Lieutenant Commander Charles Oscar Maas, USNRF, Assistant Naval Attaché to the American Embassy, Paris, France, World War I, Prize. The deadline the next competition (academic year 2018-2019) is October 1, 2018. Essays must be received by Ms. Kathy Halvorsen (kah6f@virginia.edu) in the Department of French by e-mail no later than 5:00 p.m. on that day. For complete details, see the guidelines that follow. The contest is open to all undergraduate students of French at the University who are not native speakers of French and who have not learned their French primarily in French-speaking schools. Questions concerning eligibility can be discussed with Professor Krueger (Director of the Undergraduate Program in French). The length of the essay should be between 2000 and 2500 words, about six to eight pages double-spaced. Each essay should have a title, and pages should be numbered. Essays are to be entirely the work of the participant; research materials must be referenced. (The committee takes a dim view of research conducted exclusively on the internet.) Essays are judged on choice of topic, clarity of argument, and quality of French. Students are permitted, indeed encouraged, to consult dictionaries and grammar books, but they may not seek anyone’s help with French while writing their essays. The essay must not have been previously submitted for another essay contest; it may have been written initially in the context of a University course provided that it has been developed or reworked. Former winners of a Maas prize are excluded from the present competition. Each contestant may submit a single essay. Contestants who do not win a prize in a given year, may submit a new essay the following year. Essays should be submitted as e-mail attachments in Word or .pdf format. The name of the writer should not figure within the essay itself but should be given in the e-mail message. The e-mail message will contain a pledge that the work is that of the author alone. The judges will not know the identities of the writers. Authors of essays will be encouraged to attend a special event hosted by the French Department in April. Prize winners will be announced at this event. The Winner will be entitled to receive $5,000 in documented expenses of an educational or scholarly purpose related to enhancing knowledge of the French language or francophone culture (airfare to France or a French-speaking country or region, per diem living expenses in such a country or region when such travel is related to specific educational endeavors, such as extension of time abroad before or after study abroad, consultation of archives, tuition in a degree program in a French-speaking country or region, graduate work in French, etc.). The committee may select second prize, third prize, and/or honorable mention recipients. These awardees will be entitled to prize money to be used for similar expenses. Recipients will have two years from receipt of reward to spend these funds. Before the end of two years, all recipients must submit a narrative explaining use of funds and receipts. Unspent funds or failure to provide receipts and a narrative by the end of two years may lead to a requirement that the recipient refund the department the full amount of the award (or partial if a portion of the funds is left unspent). The decision of the judges is final. The Maas Prize Committee reserves the right to withhold the announced prize if, in its opinion, essays submitted are not of sufficient merit. The Maas Prize Committee reserves the right to award up four additional prizes (first-prize, second prize, and Honorable Mention prizes), in its opinion, additional essays are of the highest quality. The prize was established in 1953 by the late Mrs. Kitty M. Maas as a memorial to her husband, Lieutenant Commander Charles Maas, USNFR, who presided at the ceremony in Paris on 13 April 1919 at which the University of Virginia presented the Republic of France with a plaque in memory of Thomas Jefferson.